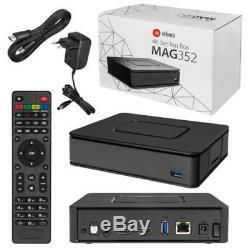 MAG351/352 Set Top Box Premium LInux 4K UHD HEVC - Built-in Wi-Fi & Bluetooth with EU Power Plug + Free 3 Pin UK Converter. No premium channels included e. ITEM WILL BE DISPATCHED FROM OUR UK WAREHOUSE. MAG351 is a premium IPTV/OTT Set-Top Box for operators, providing TV services via IP networks. Main advantage of the MAG351 is 4K standard support that will give you an opportunity to watch the video in the best quality. In turn, the 2 GB of RAM and Broadcom chipset with 12 000 DMIPS create extra velocity. 4K support; HEVC support; Super-power media processor with Broadcom chipset and 12 000 DMIPS productivity; 2 Gigabyte of RAM; In-built dual-band Wi-Fi 2.4GHz/5GHz(ac)(optional) and Bluetooth 4.0 adaptors. IPTV/OTT Set-Top Box of Premium Class. MAG351 plays the latest audio and video formats and it supports subtitles, format and image settings, choice of audio track and work with the playlists. MAG351 can playback up-to-date video resolution UltraHD, giving the most realistic image. Larger RAM and powerful media processor by Broadcom allowed us to increase the velocity of STB. The multi-purpose remote control allows managing not only the Set-Top Box, but also it can operate other devices. You can connect a wireless keyboard and mouse through USB port for more comfort in operating MAG351. 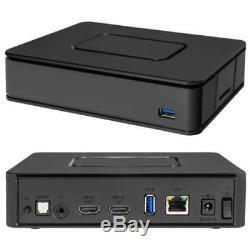 Compatibility With Any TV System. The Set-Top Box MAG351 can be connected both through HDMI and RCA cables. Infomir Set-Top Boxes is approved with CE, FCC and EAC certificates that guarantee their quality and accordance with international standards. Chipset: BCM7252s Processor: ARM A15 (B15) Dual Core CPU Processor perfomance: 12 000 DMIPS RAM: 2 Gb Flash memory: 8 Gb. HDMI 2.0-output, HDMI 2.0-input, Composite + stereo A/V output, Audio output S/PDIF, Ethernet 1 Gb/s, 2USB 3.0 (Wi-Fi adapter can be connected), SD slot, Built-in Wi-Fi 2.4 GHz/5 GHz ac (optional) Sources of media content PC and NAS in local network, Stream media protocols (RTSP, RTP, UDP, IGMP, HTTP), USB-devices Audio&Video Audio? Odecs: MPEG-1 layer I/II, MPEG-2 layer II, MPEG-2 layer III (mp3), Dolby Digital plus (optional), DTS (optional) Audio formats: MP3, MPA, M4A, WMA (optional), OGG, WAV Video modes: 1080i, 1080p, 720p, 576p, 480? 265 (HEVC), MPEG4 part 2 (ASP), WMV-9 (optional), VC1 video, XviD; 3D and HD video supporting Video containers: MKV, MPEG-TS, MPEG-PS, M2TS, VOB, AVI, MOV, MP4, ASF, QT, WMV Image formats: JPEG, PNG, BMP, GIF, RAW Subtitles: DVB, SRT, text MKV Playlist formats: M3U. MAG351 Set-Top Box, Mini jack cable to RCA (A/V), Remote control, 2 AAA batteries, packaging, Power adapter 12 V 1 A, User manual. Please note, if you dont want the item for any other reason postal charges is yours. Any return, please send by recorded post only. The item "MAG351/352 Set Top Box IPTV Linux 4K UHD HEVC In-built Wi-Fi and Bluetooth" is in sale since Tuesday, March 13, 2018. 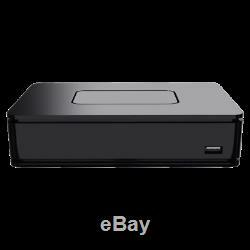 This item is in the category "Sound & Vision\TV & Home Audio Accessories\Internet TV & Media Streamers". The seller is "megastore2018" and is located in London. This item can be shipped to North, South, or Latin America, all countries in Europe, all countries in continental Asia, Australia.